Spiritual Direction Colorado - Rev. Jane Vennard Presents: "We Are All Teachers"
Rev. Jane Vennard Presents: "We Are All Teachers"
Whether in a classroom, family, community, or institution our very presence teaches those around us. Sharing from her new book Teaching - The Sacred Art: The Joy of Opening Minds and Hearts, Jane will discuss and guide you in finding ways to become more intentional and effective in teaching others what you value most. The Rev. Jane E. Vennard is Louise Warren Iliff Senior Adjunct Faculty in prayer and spirituality at the Iliff School of Theology in Denver, Colorado. She earned her B.A. from Wellesley College, her M.A. from Stanford University and her M.Div. from San Francisco Theological Seminary. She was called to a special ministry of teaching and spiritual direction and was ordained in the United Church of Christ. 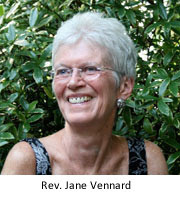 Jane is a spiritual director in private practice, teaches classes in a variety of ecumenical settings, leads retreats internationally, and is the author of numerous articles and seven books.